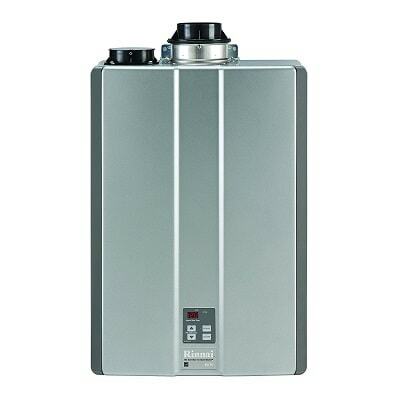 Finding the best tankless water heater can be a little bit of a challenge. There’s a lot and I mean A LOT of overwhelming information online. If you’re looking for a good place to start you’ve come to the right review guide! Water heaters are a must have, but big water bills are not. There is a growing trend of people who are opting to go with tankless options instead of the traditional tank water heater. Tankless water heaters are powered by natural gas, propane, or an electric unit. Below, I will discuss the numerous benefits of owning one, some of the drawbacks, and how they measure up against tank water heaters. Since there is no tank storing and heating 50 gallons of water at any given moment, they use up to 50% less energy. It’s is only used when YOU use hot water, minimizing the amount of wasted energy. Not only can this be good for the environment, this can also save you money. Again, since there is no big tank, water heaters without their tank take up much less space and can usually just be mounted right on the wall. This gives you extra storage space for whatever you want. When I switched to one a few years ago, I was able to reclaim my old shed that used to only hold my water heater. Have been known to last up to ten years longer than tank units. This means you replace it less often and save even more money over time. Since there is no tank, there is also no chance of a ruptured tank flooding your house. A burst water heater can be a nightmare. It is expensive to fix and can cause property damage to your house. By going tankless you completely eliminate this as a possibility. While they may significantly cut your bill, tankless options also have a much higher initial cost than tank water heaters. They can cost up to 3 times as much as tank heaters, but they are well worth the investment. The maintenance of tankless heaters over their entire lifetime, is much cheaper than the maintenance of tank water heaters. Tank heaters are also much harder to control than tankless heaters. Tankless units are controlled electronically, usually with a remote control, and can be programmed to heat the water to a precise temperature. They also have an unlimited supply of hot water as they can instantly heat up the water when needed. Tank heaters on the other hand are limited to the capacity of their tank. Lastly, they’re are much more energy efficient and most of them are even Energy Star certified. Electric tankless heaters emit no greenhouse gases and have a very small environmental footprint. 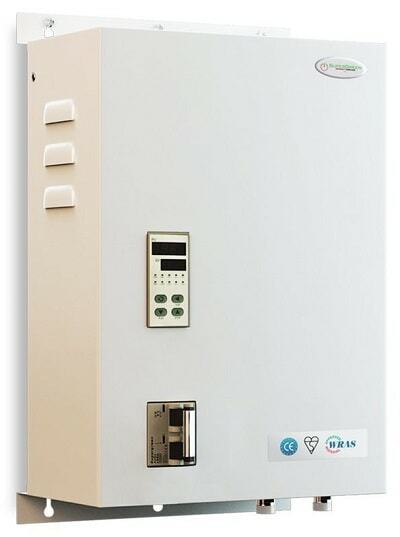 I am a big proponent of the electric tankless water heaters, for the reasons I’ve already mentioned, such as the lower installation and maintenance costs. However, gas water heaters have their own strengths, and ultimately many things will factor into your choice of an electric, propane, or natural gas powered heater. No matter what fuel source you choose to use, you will receive the benefits of owning one. In some areas, electric models are not offered, in which case natural gas or propane fueled ones are just as good. The electric control of this makes it easy to get the exact temperature that you want. The sleek design is unlike what you would typically expect from a water heater. Because there is no tank, it is not large and bulky; instead, it is sleek and compact. The copper parts make it easy to interchange parts and make minor repairs inexpensively. The self-modulating flow sensor regulates how much energy is used heating water. 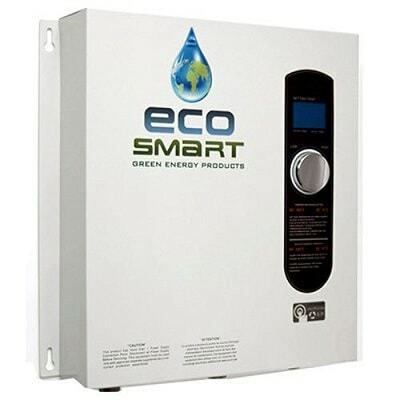 The EcoSmart can keep up with high water demands and in the right climate, can easily be used to heat an entire house’s water supply. It is known for being durable and standing the test of time, and is also one of the most affordable ones on the market. The only downside of this is that it will not perform correctly in all climates. Only people in certain areas can use this heater. However, the same company makes several other models aimed at different climates, so if this particular one is not viable in your area, you can always try a different model. The anti-scald protection in this allows the water to be heated to a certain degree. Once the water reaches 131°F, it automatically shuts off. This prevents accidental burning, which is especially useful if you have kids who don’t realize how hat the water can get. This tank requires no routine maintenance like typical water heaters. You don’t have to flush it out annually or replace any of the parts; it is built to last. This is also useful because it saves you lots of time and money over the years. It uses unique infrared technology to heat up quartz bars, whereas other heaters use metal heating tubes. The quartz heating tube and infrared energy are used to heat the water without ever touching metal. It comes with a built-in CFGI, which protects against power outages and other potential problems. Since the water never touches metal to heat up, this also eliminates the problem of corrosion. In other water heaters, the metal heating tubes would have to touch the water, which over time would lead to corrosion and would have to be regularly replaced. Unfortunately, this is another model that works best in certain areas. If this this will not perform well in your climate, there is no point in wasting your money on it, instead look for a water heater built to withstand whatever climate you live in. The knob on the outside of the unit is how the temperature is controlled. It is super easy to use and there’s no chance of you losing it, like a remote. Some people are skeptical of tankless water heaters’ ability to keep the water hot, even if it’s running for a while. The built-in flow sensor prevents this from happening by ensuring that all the water coming out is the same temperature. Its compact design makes it easy to install anywhere. Even if you have absolutely nowhere in your house to put it, don’t worry, it can easily be installed on an exterior wall as well. The Bosch electric comes in a few different sizes, which means it works on different sized houses. A water heater that is too big or too small for your house will either cost you way more than you have to spend, or cost you less but not be able to service your whole house. The nice part about this model is that it can last twice as long as your average tank water heater. 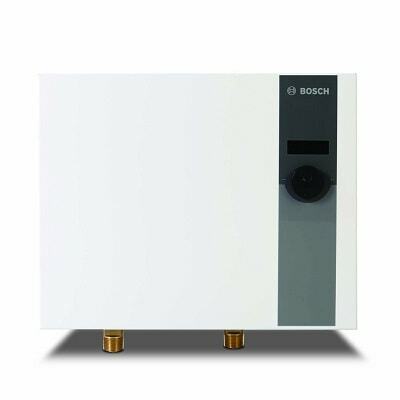 You can expect this one from Bosch to last over 20 years, and if it doesn’t, there is a 5 year limited warranty on its heater exchanger, and a 2 year limited warranty on other parts. Unfortunately, I have not been able to get a solid answer as to what the exact temperature range of this particular unit is. However, when I tested it, the water came out just as hot as it did with any other heater. So although I don’t know just how hot it can get, I know it gets hot enough. With this incremental temperature control, it is easy to set the temperature to whatever you want between 80°F and 140°F, it is much more precise than tank water heaters and is accurate within one degree. The copper heating elements in this unit make it very durable, and very effective because it is a really good conductor of heat. 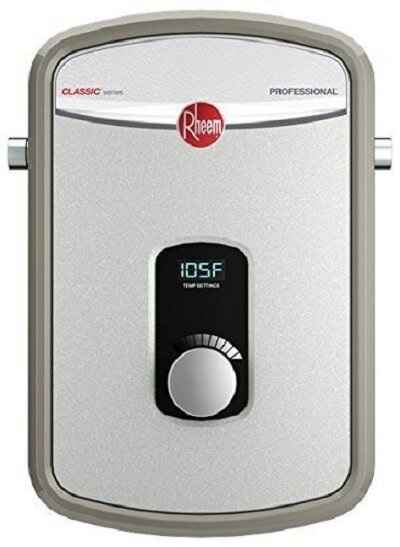 You can practically install the Rheem RTEX-13 and never have to worry about it again. Once you set the temperature, you probably won’t have to change it very much. Plus, setting the temperature is easy to do with the large, easy to read LED temperature display. This option is one of the more affordable ones. It only puts you back a couple hundred backs, instead of possibly thousands of dollars, like others. The Rheem RTEX comes with a 5 year no leak warranty, and a one year parts warranty. I always love warranties because it reduces any of the risk associated with purchasing. The only downside to this is that the copper heating element will more than likely need to be replaced. However, thanks to the warranty and the easily replaceable nature of the parts, this should no hassle for a professional, and shouldn’t cost too much either. Since this is a gas powered heater, you will have to have some form of ventilation. However, you are not locked into one specific method; this Rinnai can either be used to concentric, or PVC venting. Differs depending on if it is for commercial or residential use. For residential use, you will receive a 12 year limited warranty on the heat exchanger, 5 year warranty on parts, and a one year warranty labor, which you can choose to extend to 5 years. Although it might be heavy, it can be installed pretty much anywhere, thanks to its compact design and simple shape. Not only does this heater have an easy to use temperature control on the exterior, it is also compatible with the full line of Rinnai digital controllers. This means you get to choose how you want to control it. It also has some really great features. Unfortunately, that also means it is one of the more expensive ones on this list, however, it is worth the money. Ultimately it is up to you to weigh the costs and benefits and make the final decision. Like some of the others, this one has a digital display temperature control on the outside of the unit. You can set the temperature at any degree between 90°F and 135°F; the control goes up incrementally by one. This heater amazingly maintains the temperature you set it at. Instead of wavering, or being several degrees off, it maintains water temperature within 0.5 degrees. 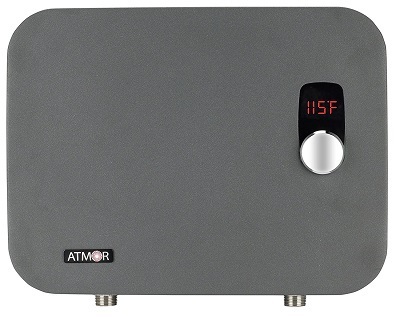 The Atmor comes with 2 year warranty, and although it is limited, it is still a great warranty plan, which is always nice to have in place. This unit is the least expensive one on the list, making it a really great option for anyone on a budget. There is no need to spend thousands of dollars if this one suits your needs. As with most other models, you may encounter a few problems when it is first installed. Some of these problems include the water not being hot enough or the water being too hot. However, there is a very useful user manual included with an entire troubleshooting chart for any problems you may encounter. The external digital control is easy to manipulate and can be used to set the temperature anywhere from 86 degrees to 140 degrees. However, it is not recommended to ever set it above 122°F for safety purposes. This heater is certified to be frustration free. That means you can be assured that this is easy to use and reliable. 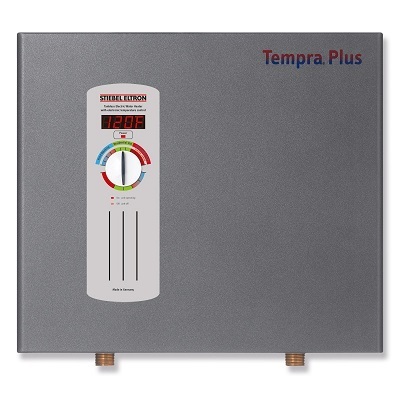 The Tempra Plus comes with a seven year no leak warranty and a three year parts warranty. This is really nice because most other warranties are only for one or two years. Another great thing about this particular bran is that it is totally quiet while it is in use. This means it is not a distraction for other people in the house and can basically be forgotten about once it is installed. Unlike gas powered heaters, this one requires no venting, making it easier and less costly to have installed. It also makes it easy to put pretty much anywhere in your house. Like the other electric heaters, this one has specific models that work in specific climates. It is easy to find which model is best for you though. The manufacturer has a map available that tells you what model is best based on where you live. This propane heater has a direct vent, like most gas fireplaces. The good news about this is that direct vents aren’t too hard for professionals, so hopefully that will keep the installation price lower. One argument people use against gas powered versions is that the emissions can be harmful to the environment. However, this brand has very low emissions, is very energy efficient, and is even Energy Star certified. It comes with a 10 year heat exchanger warranty and a five year warranty that covers other specific parts. With tank water heaters, in cold winter months, you have to leave a faucet on in your house so that the water and pipes would not freeze. However, this tank comes with freeze protection, meaning you can have hot water whenever you want, despite what the weather may be. 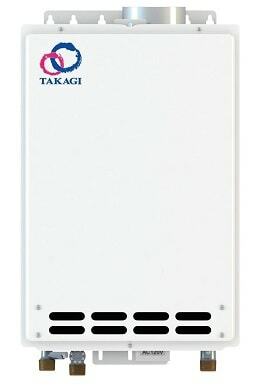 This particular model that we are reviewing is the smallest unit Takagi makes, but it’s perfect for apartments or small homes, making it great for people who live alone or have small families. For a larger home I would recommend going with the Takagi T-K4-IN-LP. Since this is propane powered, the installation may cost a little more. Usually, when you buy it you can buy the installation too though, that is probably the best option. What type of tankless water heater is right for you? The two main types of water heaters are electric and gas powered. There are also different gas powered heaters, like natural gas and propane powered heaters. It is always a good idea to do additional research after finishing reading this, but I would recommend you choose an electric water heater. Electric models are just less of a hassle all the way through. They cost less to install, they do not require venting, they require no maintenance, they cost less to operate, and they have a smaller environmental impact. Electric tankless water heaters are generally 98+% energy efficient while gas and propane hover anywhere between 80-85%. There is no need to buy a bigger than you need, especially because it will cost you more money. One way to determine what size you will need is to add up the flow rates of all the faucets in your house. This is the flow rate that you want your heater to have, that way it could supply water to your whole house at once if necessary. If you choose one that is too small, you will only be able to use one or two appliances at a time, which will just become a pain in the neck. What are the initial startup costs? As I mentioned earlier, the initial startup cost is the most expensive part. It can cost you up to a couple thousand to install one, depending on what kind you get and what size it is. Never try to install one yourself unless you’re a professional. It’s a very complicated, and potentially dangerous, process if you do not know what you are doing. Even if you’re the handy man who does all the home improvements, it’s really best to leave this one to the pros. Having professionals install your unit ensures that it is installed correctly and decreases the risk of something going wrong. We hope you’ve enjoyed our reviews of the 8 best tankless water heaters. Have questions? Drop us a comment below!